Tomorrow, 8th April could be a sad day for all those who are still using Windows XP, as it is an official assassination day of it, but there is also a good news that Microsoft is going to stop charging for its Windows Operating System on on the devices with screens smaller than nine inches. 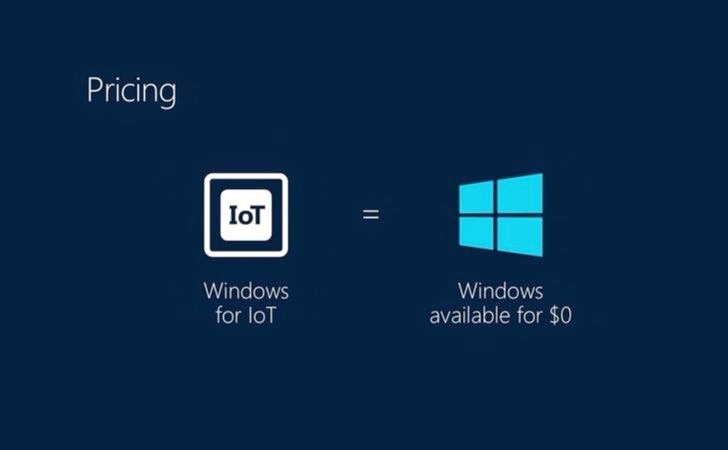 Yes, Free a Windows OS for the Internet of Things (IoTs), such as Mobile Devices, Smart thermostats, Smart TVs, wearable devices etc., that was announced by Microsoft at Build 2014 conference on Wednesday. “To accelerate the creation of great mobile devices running Windows and grow our number of users, we announced today that Windows will be available for $0 to hardware partners for Windows Phones and tablets smaller than 9” in size,” said Terry Myerson, executive vice president, OS Group at Microsoft and he also added that it will include a one-year subscription to Office 365. Free Windows, means the manufacturers of small tablets, phones and any other small devices won't have to buy a license from Microsoft. According to Microsoft, Windows for Internet of Things will use the same code base as Windows Phone 8, which will run only the mobile apps, not any desktop software, and also they didn't mention about open sourcing the code base of Windows for IoTs, as Google’s Android. The reason behind it may be in an effort to make it tough for hackers to exploit the operating system and to ensure the code is sound and secure. Distributing free Windows could be a prominent step, but it’s one that Microsoft needed to take earlier, because Google’s free mobile operating system - Android is used widespread among the consumer electronics devices. The reason Microsoft required to move on to some strategic approach is to catch up with Google's Android and Apple's iOS operating systems. Since, Google’s android is an open source, which is freely available to everyone, so anyone can use it without paying a single penny and even Apple is also pushing itself hard to bring its operating system prices towards zero. But, on the other hand, Microsoft is charging $10 for its Windows Phone operating system on each Smartphone and tablet, which made existence toilful for Microsoft in recent years. So, to boost its monopoly in the world of smart devices, Microsoft took a tremendous move in a right direction. The new update will definitely help Microsoft to beef up its app marketplace, as it allows developers to build apps for Windows 8.1 tablets, as well as for Windows Phone 8.1 Devices. In addition, Microsoft has also announced the next version of the Windows Phone operating system, Windows Phone 8.1, which comes with several new features, including the voice controlled Cortana digital assistant. Cortana is named after a female character in Microsoft's Halo video game, and is aimed as a competitor to Apple's Siri for iOS. Microsoft said Cortana can interact with third-party Windows Phone apps such Skype, Hulu Plus, Facebook and Twitter, all of which can be controlled via voice commands.